Like you, I was deathly afraid of failure. Like so afraid, I tried to manage my life in a way that would appear ‘perfect’. I hated making ANY mistake, as I would appear weak, invaluable, stupid, and like… a total failure. Funny thing is, I’m human last time I checked, and I couldn’t fully avoid making mistakes. So, when I made them, I would beat myself up for ridiculous periods of time following said failure. The loop of facts running through my mind so I could pick apart where it all went wrong…Ok, not at all productive, can we agree on that? Fast forward many years, and I’ve started to VALUE the process of failure. Sounds crazy, right? Stick with me, because it will all make sense soon. I remember several years ago, my team and I were working on a prospect, and we wanted to make a really good impression. Show them we weren’t just some boutique firm of amateurs. One of our differentiators as a firm, was our ability to create custom, easy to understand employee communications for our clients. We took the complicated world of insurance, and made it relatable, and simple for the employer, thereby minimizing the burden of confusion and constant questions from their employees. So, my colleague and I decided we needed to enlist the help of our communications guru to help us come up with a powerful video that would show our capabilities, including our ability to get the message across in a simplified, modern way that was relatable to the team we were presenting to, as well as their employees. No brainer right? Wrong. After a great deal of creating the perfect video, we had a winner on our hands! We got chills when we were presented with the final product from our communications team member. I couldn’t wait to show this gem to the prospect…. As we entered the room to start our presentation, we wanted to start with the video first. So we walked in the room, quickly connected our laptop to their equipment, hit ‘play’, and the video wouldn’t load. Then a little maneuvering, and it finally loaded. Then it froze. The prospect saying ”oh yeah, we forgot that the signal in this room is pretty weak. Sorry.” Ok, after some internal panic, troubleshooting and trying to get their IT expert on hand, we finally got the video to roll. Except it didn’t have any sound! OMG, that was the best part, that tied it all together. HOW COULD THIS BE HAPPENING!? Needless to say, we didn’t get the account, but we still had a great meeting, considering we were a bit deflated from the start. What happened though, in light of our big fat flop, we learned the art of preparedness. Don’t depend on other people’s technology to make yours work. Be prepared to make your presentation work on its own, no matter how you accomplish this, it will result in you looking polished and prepared for unknowns. Be prepared for something catastrophic to go wrong, and have a solution in your back pocket so you can say, ah, I’ve got you covered. Like a thumb drive. Plug it into your computer, and voila! You have a video ready to play now, not when the WiFi decides to cooperate. It’s ingrained in us to be afraid to fail. The fight or flight instinct creates this need for us to run if something is uncomfortable. While that may have worked when we were fighting off wildebeests, but it no longer serves us now. There is no need to run when we get uncomfortable, as a matter of fact it will create the opposite effect. How you handle Fear is your choice alone. I’d encourage you to let your guard down and learn to embrace the value failure creates in your life and business. It allows you the opportunity to evaluate the facts, understand what went wrong, and course correct. The difference between successful people and unsuccessful people, is their ability to persist when they are knocked off their game. 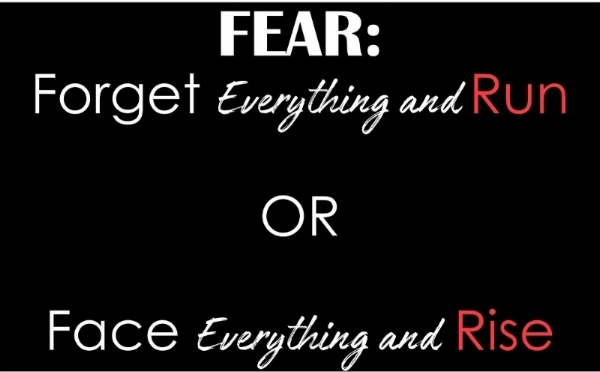 What are you going to do when faced with fear. Are you going to face it or run?